During a stay at the Ventus at Marina El Cid Spa & Beach Resort by El Cid Resorts, booking a service at the rejuvenating El Cocay Spa is a must. 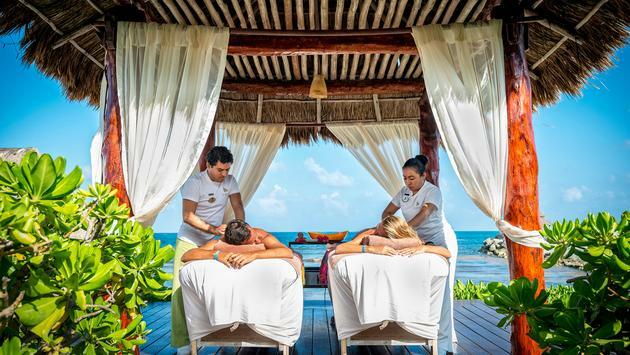 A trip to this beautiful property is already a peaceful experience due to the stunning beachfront location in Riviera Maya, but a visit to the spa takes relaxation to the next level. The Kukulcan Massage is always a great treatment to start with if you aren’t sure what the best option is for you. Guests are first guided to the Temescal Zone so the details of the full massage service can be explained. This massage requires two therapists, so guests will be pampered with a four hands massage. It can be done in one of the beach gazebos or in a cabin. Another service to try is The Temazcal Sacred Bath, which is said to clear the body and mind and purify the spirit. It involves the rhythm of drums and a flute, a steam filled room and fresh herbs to get the blood circulating. A Chuumuk Massage includes the use of essential oils. For this service, therapists pamper guests with a deep relaxation massage hitting the chakras, also known as the seven major energy centers of the body. People are left with feelings of harmony and balance afterward. Spa treatments have many benefits on both the mind and body, so it’s important to indulge every now and then—especially on vacation! For more information on the spa at Ventus at Marina El Cid, visit the website: www.ventusatmarinaelcid.com.